Transaction Routing Management allows the merchant to set the time zone for the merchant account. When allowed by the processor, it is used to determine the end of day settlement for the merchant account. 1. Allows the merchant to use a single mKey for the merchant accounts with the same account type, thus simplifying integration. 2. Enables the ability to route refunds from a closed merchant account to a new/open account. a. Example: Merchant closes a merchant account with Processor A. Refunds for that account will need to be routed to the new merchant account (Processor B). At the same time, the merchant can use the existing mKey used in their API integration to send transactions to Processor B. No changes to the integration are required. 3. If the Smart Routing module is selected in the company settings of at least one company account: Secondary operation will always go to the merchant account, from which the initial transaction has been processed even if account mkey is changed. This rule is applicable if mkey of void and the initial operation are associated with the same company. 4. Can be used to create and manage mKey’s for a Load Balancer rule set allowing the merchant to use multiple load balancing schemes. Note: To locate, setup, or edit the Transaction Routing, there are two options. Option 1: Click on the menu item Administration > System Configuration > Load Balancer. At the top of the page there is a Transaction Routing button that will direct you to the initial Transaction Routing Management page. Option 2: Click on the menu item Administration > System Configuration > Transaction Routing. This will direct you to the initial Transaction Routing Management page. On the bottom right corner of the table will be an Add Transaction Routing button to add a new Transaction Routing mkey. Also user is able to delete routings on this page by clicking the 'Delete' link. But it is impossible to delete last enabled routing of the account. 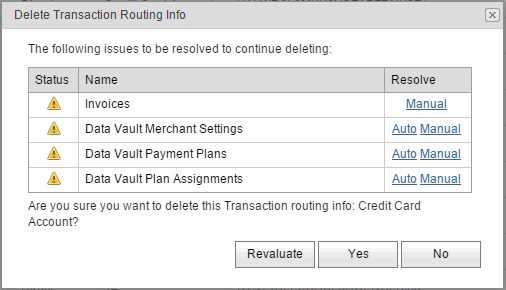 If the routing is used in Invoices, Data Vault Merchant Settings, Payment Plans or Plan Assignments and user clicks the 'Delete' link the popup appears with the suggestion to resolve these issues manually or automatically. If user chooses to resolve the issues manually then the system redirects him to the page with the list of items in which this routing is used and user should reconfigure all of them before deleting the routing.